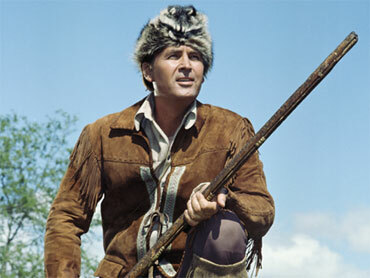 Actor Fess Parker, who became every baby boomer's idol in the 1950s and launched a craze for coonskin caps as television's Davy Crockett, died Thursday of natural causes. He was 85. Family spokeswoman Sao Anash said Parker, who was also TV's Daniel Boone and later a major California winemaker and developer, died at his Santa Ynez Valley home. His death comes on the 84th birthday of his wife of 50 years, Marcella. "She's a wreck," Anash said, adding Parker was coherent and speaking with family just minutes before his death. Funeral arrangements will be announced later. The first installment of "Davy Crockett," with Buddy Ebsen as Crockett's sidekick, debuted in December 1954 as part of the "Disneyland" TV show. The 6-foot, 6-inch Parker was quickly embraced by youngsters as the man in a coonskin cap who stood for the spirit of the American frontier. Boomers gripped by the Crockett craze scooped up Davy lunch boxes, toy Old Betsy rifles, buckskin shirts and trademark fur caps. "The Ballad of Davy Crockett" ("Born on a mountaintop in Tennessee...") was a No. 1 hit for singer Bill Hayes while Parker's own version reached No. 5. The first three television episodes were turned into a theatrical film, "Davy Crockett, King of the Wild Frontier," in 1955. True to history, Disney killed off its hero in the third episode, "Davy Crockett at the Alamo," where the real-life Crockett died in 1836 at age 49. But spurred by popular demand, Disney brought back the Crockett character for some episodes in the 1955-56 season, including "Davy Crockett's Keelboat Race." In reporting this development, Hedda Hopper wrote: "Take off those black armbands, kids, and put on your coonskin caps, for Davy Crockett will hit the trail again." But just as suddenly it had taken the country by storm, the craze died down. Parker's career then leveled off before he made a TV comeback from 1964-1970 in the title role of the TV adventure series "Daniel Boone" - also based on a real-life American frontiersman. Actor-singer Ed Ames, formerly of the Ames Brothers, played Boone's Indian friend, Mingo. After "Daniel Boone," Parker largely retired from show business, except for guest appearances, and went into real estate. "I left the business after 22 years," Parker told The Associated Press in 2001. "It was time to leave Hollywood. I came along at a time when I'm starting out with Gary Cooper, John Wayne, Sterling Hayden and Gregory Peck." "Who needed a guy running around in a coonskin cap?" he said. Parker had made his motion picture debut in "Springfield Rifle" in 1952. His other movies included "No Room for the Groom" (1952), "The Kid From Left Field" (1953), "Them!" (1954), "The Great Locomotive Chase" (1956), "Westward Ho, the Wagons!" (1956), "Old Yeller" (1957) and "The Light in the Forest" (1958). Several of Parker's films, including "The Great Locomotive Chase" and "Old Yeller," came from the Disney studio. It was Parker's scene as a terrified witness in the horror classic "Them!" that caught the attention of Walt Disney when he was looking for a "Davy Crockett" star. He chose Parker over another "Them!" actor, James Arness - who became a TV superstar in the long-running "Gunsmoke." After departing Hollywood, Parker got into real estate with his wife, Marcella, whom he had married in 1960. He bought and sold property, built hotels (including the elegant Fess Parker's Wine Country Inn & Spa in Los Olivos and Fess Parker's Doubletree Resort Santa Barbara) and grew wine grapes on a 2,200-acre vineyard on California's Central Coast, where he was dubbed King of the Wine Frontier and coonskin caps enjoyed brisk sales. After its inaugural harvest in 1989, Parker's vineyard won dozens of medals and awards. The Parkers' son, Eli, became director of winemaking and their daughter, Ashley, also worked at the winery. Parker was a longtime friend of Ronald Reagan, whose Western White House was not far from the Parker vineyards. Reagan sent Parker to Australia in 1985 to represent him during an event, and when Parker returned he was asked by White House aide Michael Deaver if he was interested in being ambassador to that country. "In the end, I decided I'd better take myself out of it. But I was flattered," Parker said. Parker also once considered a U.S. Senate bid, challenging Alan Cranston. But Nevada Sen. Paul Laxalt said it would be a rough campaign, and a key dissenter lived under the same roof. "My wife was not in favor," Parker said. "I'm so happy with what evolved." Fess Elisha Parker Jr. was born Aug. 16, 1924, in Fort Worth, Texas - Parker loved to point out Crockett's birthday was Aug. 17. He played football at Hardin-Simmons University in Abilene but was injured in a nearly fatal road-rage knifing in 1946. "There went my football career," Parker had said. He later earned a bachelor's degree from the University of Texas. Parker was discovered by actor Adolphe Menjou, who was Oscar-nominated for "The Front Page" in 1931 and who was a guest artist at the University of Texas. Menjou urged him to go to Hollywood and introduced Parker to his agent.